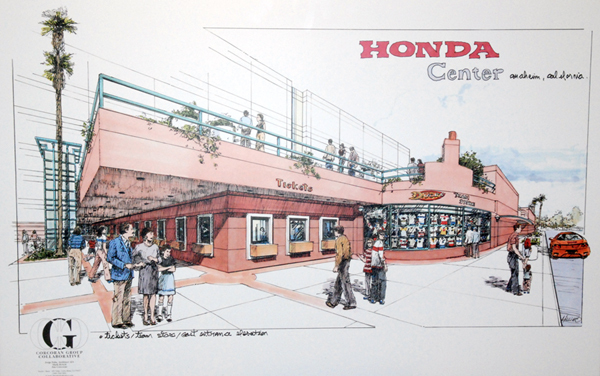 Honda Center is getting a face lift. Honda Center will undergo an eight-figure renovation beginning this fall, Anaheim Arena Management, LLC announced today. The facelift is more expensive than expansive, targeting the east side of the building where the ticket booths and Ducks team store are located. The team store will expand out from the building, growing from 1,800 to 4,200 square feet, with a 12,000 square-foot terrace above featuring an 80-foot bar and upscale dcor. On the main level, a 250-seat full service restaurant will be added. A timetable for the construction wasn’t immediately available, but the majority of game-day car and foot traffic probably won’t be affected by the project. While it’s nice to see that there will be more to do within walking distance of the arena before and after Ducks games — a needed amenity in the “Platinum Triangle” area — perhaps the true impetus behind the project was buried deep inside today’s press release. “More than ever, Honda Center itself will be NBA-ready,” Anaheim mayor Tom Tait said. Forbes ranks Ducks 13th on list of most valuable franchises. In its annual Business of Hockey feature, Forbes magazine estimates the Anaheim Ducks’ value at $206 million, 13th among NHL franchises (and $2 million behind the Los Angeles Kings). Click here for the complete list. Encouraging for the Ducks is that Forbes estimated a 2% increase in franchise value from 2007-08 to 2008-09, a period that saw a Honda Center sellout streak end at 78 games. James Mirtle takes an even broader look at the teams’ estimated revenue — not value —on his blog, revealing a $40 million gain for the Ducks over a five-year period from 2003-04 (when Disney owned the team) to 2008-09. Only three teams (Toronto, Montreal, Pittsburgh) witnessed an equal or greater increase in revenue over that span. Hard to believe that in 2003-04, Forbes estimated fewer revenue gains for only Buffalo, Carolina and Pittsburgh.